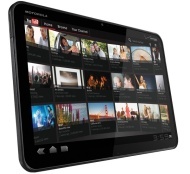 alaTest has collected and analyzed 1485 reviews of Motorola XOOM. The average rating for this product is 4.2/5, compared to an average rating of 4.3/5 for other products in the same category for all reviews. People really like the battery and price. The screen and performance also get good feedback, but the apps and portability get negative opinions. The first Android Honeycomb has created a buzz, but can the Xoom sting Apple where it hurts? The Motorola Xoom is the first Android 3.0 tablet to hit the market. That makes it the first Android tablet to ship with an OS that's designed especially for big screens, and that's why it's so exciting. Android 3.0 makes Google-based tablets much easier to use, but the Xoom isn't quite as smooth as the Apple iPad 2.